As I walked outside late this afternoon (just to see what plants looked sad and dry!) I knew that this was going to be a special evening! The sweet and heady scent that ran throughout my yard, again, took me back to a time when I was young. 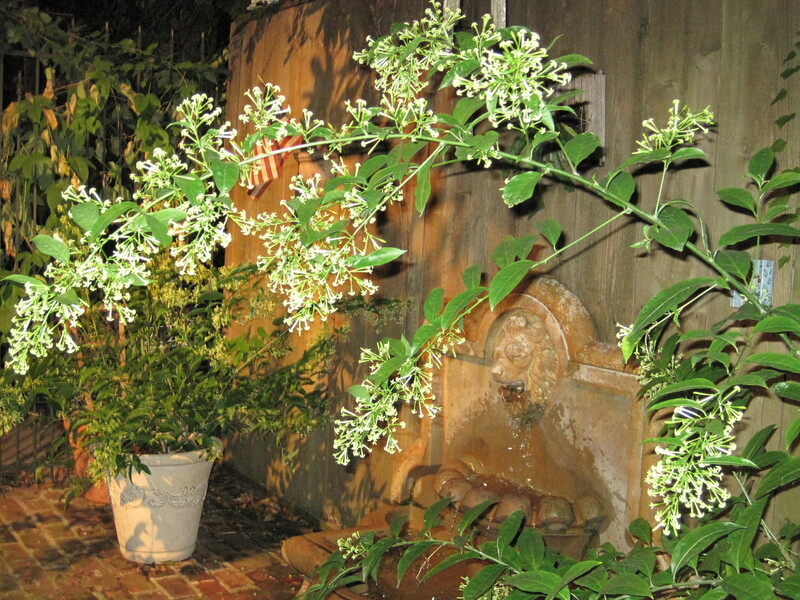 There was a “magical” plant in my grandmother’s yard that bloomed only at night, in the late summer and fall…my mother loved it so much and talked about it every evening it was in bloom….Night Blooming Jasmine! So, when we moved into our home, I had to have some of this “magic” back again! I can tell you, that it is not easy to find these plants…I went online and ordered – not one – but three! I have nurtured these three little plants for several years now…keeping my husband from “whacking” them back when they looked straggly! Miracle Grow, watering, watching them freeze in the winter – only to sprout back in the spring! Finally, in the past couple of weeks I have seen them starting to create hundreds of tight flower buds… Payoff time! If only I could have captured the whole experience to share…sitting in our quiet backyard, with a beautiful clear sky full of stars and the strong sweet fragrance of Night Blooming Jasmine! It was an incredible simple evening – after waiting so long for the “magic”… it was well worth it! So what does this have to do with food and cooking? It’s all about planning ahead…. If you have been smart or lucky enough to freeze leftovers from all of those delicious meals – Tonight would be the night! Always keep a stash in your freezer, for nights like this…just pull something out, heat in the oven or microwave and you have a great meal to top off a fabulous evening. Worked for me this evening! Thanks! Would love to do a “sharing” of grandmother’s plants! Oh, Carolyn, I want to be in your backyard with you right now! 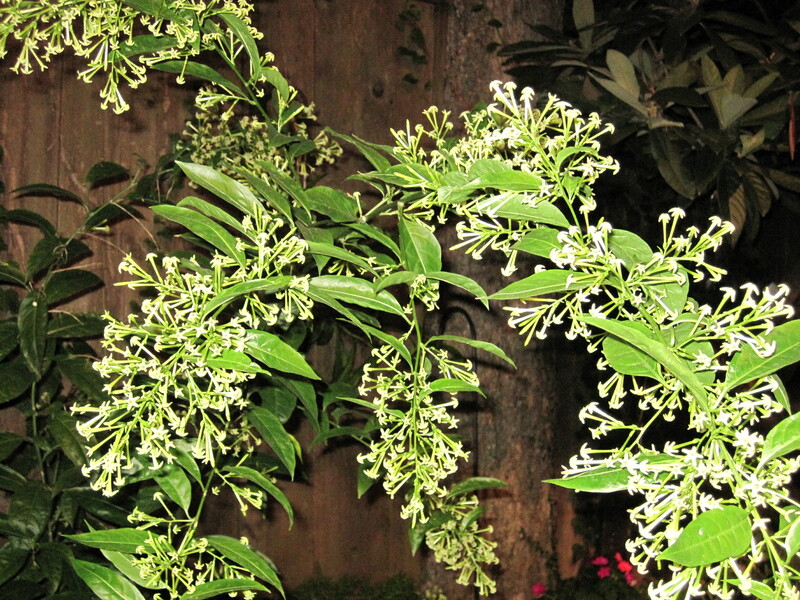 I remember the smell of the Night Blooming Jasmine, too, but haven’t been able to find any to plant. The closest thing I’ve planted to remember the old days was Sweet Olive Trees. And those leftovers are a great idea. 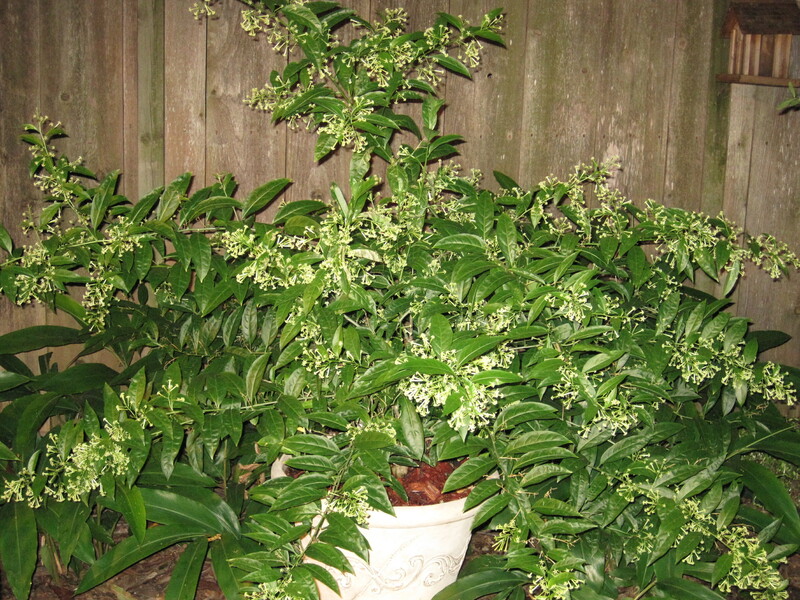 Hi Carolyn, I have a question and has nothing to do with recipes…., I have had my night blooming Jasmine for a very long time and have always had it in a pot (my dad calls it “dama de noche” which means lady of the night…) you mentioned that you watch them freeze in the winter?…. I did not know that i could do that…. I live in southern Ontario… where about do you live because i really want to plant her outside and not risk her drying out inside during those months…. Should I risk her outside in our Canadian winters?